A natural sounding pedal works as a clean boost, ”on the edge” crunch, or a sweet singing overdrive. Natural organic tone, unsurpassable touch sensitivity, sweet tube-like compression and built in inspiration. This natural sounding pedal works as a clean boost, ”on the edge” crunch, or a sweet singing overdrive, always retaining the tone of your prized guitar. 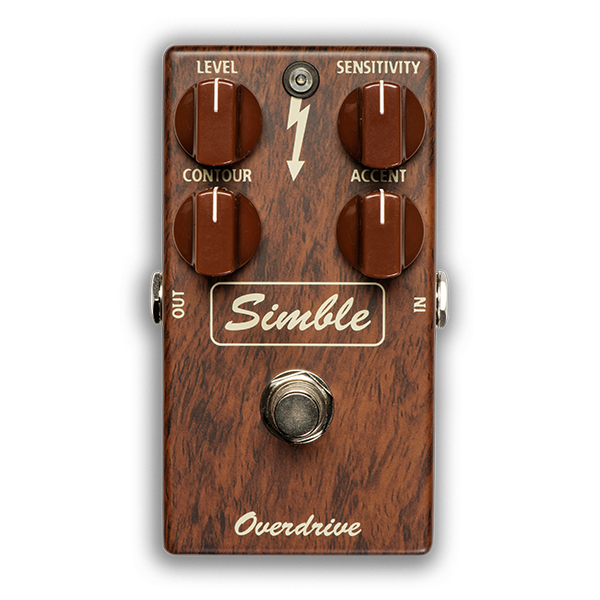 The Simble pedal is happy with either single coil pickups or humbuckers and thanks to the pedals wide bandwidth also works great with bass! Please try the Simble, you’ll be smiling in minutes! CONTROLS SENSITIVITY: Amount of distortion and compression. LEVEL: Output level. ACCENT: Adjusts the pick attack and brightness before the signal is overdriven. CONTOUR: Brightness of the output. ELECTRICAL SPECIFICATIONS Current draw: 10 mA at 9V DC approx. Input impedance: 430 kohm Output impedance: 50 kohm Voltage supply range: 9-12V Silent True bypass POWER REQUIREMENTS 6F22 9V battery or DC eliminator 2.1 mm plug center negative and positive sleeve. When LED dims, it is time to change the battery.